You agree that you use this program at your own risk ! 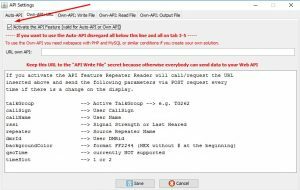 What is Repeater Reader ? Repeater Reader is a small JAVA program which „simulates“ the traffic on a selected repeater. 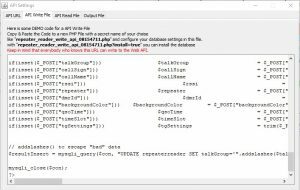 RepeaterReader is not able to read the repeater itself or the data stream to the selected repeater. 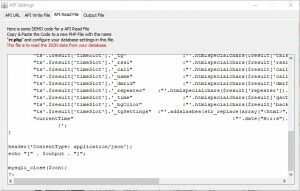 In other words, its using the same data source, the BM network (BM MQTT) but its not the same system, so if you see the website is working and RepeaterReader not its no indication that there is something wrong in the BM system. RR (RepeaterReader) reads the data stream of both „streams“ and filter out all necessary data like the selected Talkgroups or the connected Reflector. From the technical point of view all the messages are MQTT messages in different topics. But why do I need RR ? You don’t need it 😉 I designed the program to see the traffic on the repeater even if the TRX is turned of like if you are at work. RR has a sound notification (not the voice, only a sound) for all traffic or only for friends so you can let run it in the background. You can also minimize the program (ESC key) and let it stay on top (if configured) in a corner of your monitor. 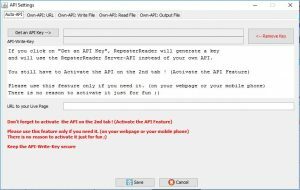 If Repeater Reader is not starting or unable to connect de-install Java and perform a new installation. Don’t extract the JAR file. Is there any support available ? Is there a Yahoo Group ? Is there Email support ? Is there forum support available ? What’s about telephone support ? On the image above (orange indicator) you can see that the (simulated) HangTime is active. On the image above (red indicator) you can see that someone is transmitting on the connected repeater. You can click on each label to disable these Talkgroups in RR, click again on the label to enable it again. On the image above you can see that Dynamic, Timed and Cluster are deactivated. Below the display you can find the currently to the repeater connected Talkgroups. The background colour indicates the kind of the TG like on the labels above the display. This should be self explaining. The last Updated filed indicates the last time were the Brandmeister System updated this information !!! AND !!! Repeater Reader read this information from the Brandmeister Network. The blue text on the right side indicates links. The first two links are links to Google Maps and the last two links are links to the Brandmeister website. Here you can define the range (in km) for the GPS messages related to a reference point. If you change this option after you received reports, these change has no affect to the received reports. If you want to see the changes you have to open the extended log. Insert a valid integer (only a number without point) and click on the „Set Max Range“ button. The table with the reports should be self-explaining because the columns are named. The only thing to mention is that the „Distance“ column is used for the LAT value and the „Azimuth“ column is used for the LONG value in no reference point is selected. here you can find all program related information and the „QSO Log“. On the left side on the top there you can find the controls for the Repeater Monitor. For testing purpose the repeater DO0JG is already in the list. The left button is the START button, the right button is the STOP button, the numbers on the right are the message counter for the „Last Heard Stream“. With a click on the left button you start the repeater monitoring. If you click again on this button you can restart the repeater monitoring. As soon as you clicked on the start button both buttons will change the design. To stop the repeater monitoring you have to click on the stop button. The design of the buttons will change back to the design before. click on the + to expand/show the menu. here you can select if Repeater Reader shall play a sound every time a friend (or all user) start a QSO an the selected time slot. In the screenshot above a sound will be played every time id a friend is transmitting on TS1 and TS2. It shows all QSOs (Group Calls on routable TGs) world wide with a length of >= 5 seconds. This can be useful to find a QSO. There are no further options availabe for this part of RR. The next options on the left side are the options for the GPS Monitoring. The options for the Reference Point were already explained above in this manual. The number (900) on the right side shows the received GPS Position reports. 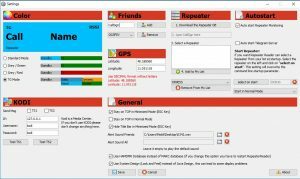 In an old version of RR there was an option to Start/Stop the GPS monitoring. I combined this option with the „normal“ Start/Stop option. To open the settings for the Telegram Support you have to click on the word „Telegram„. You will find the manual for these setting below in this manual. Again you can find the standard Start/Stop/Counter. 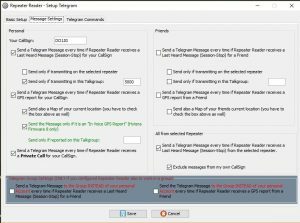 In this case you can start the Telegram Server. This is not really a server, its the function to enable some remote control functions for Repeater Reader. 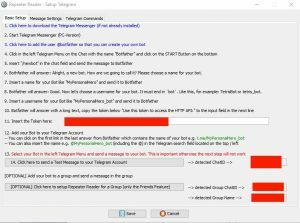 If you don’t use Telegram don’t start the Telegram Server. Also if you don’t want to use the remote control function. On the left side of the „Traffic Counter“ there is a small icon labelled with a 192. 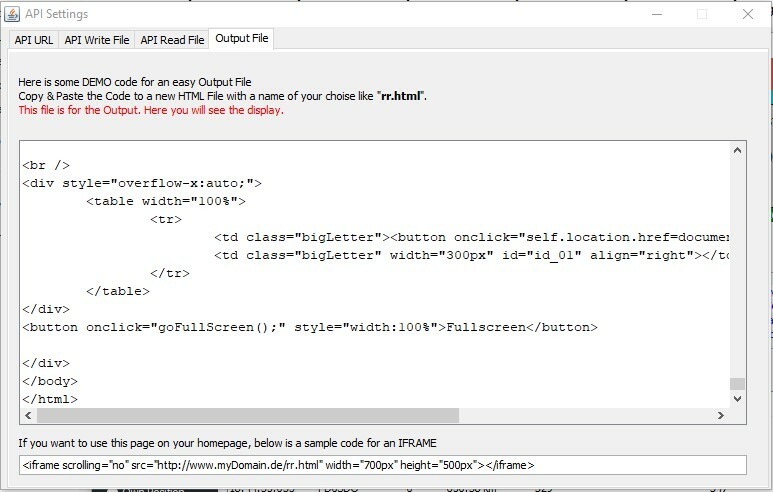 If you click on this icon you can access the options for the „Web-Api„. There are 2 options to use this function. 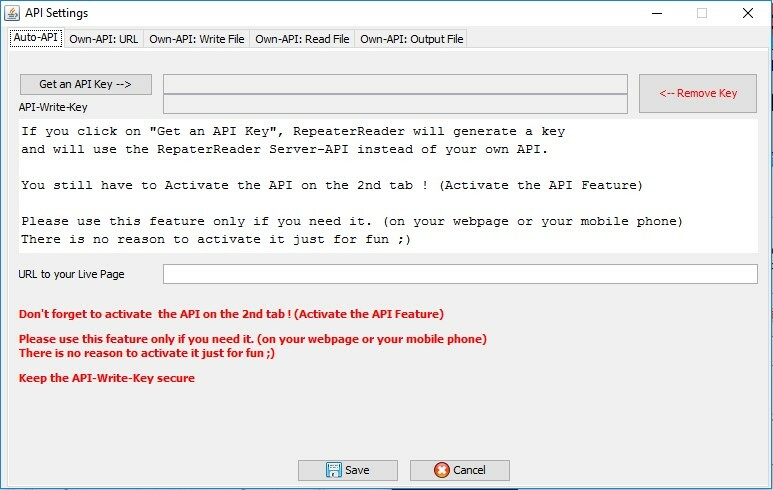 You can use the API from the „Repeater Reader Web Service“ or you can use an own API. To use an own API you need to be familiar with PHP, HTML and MySQL and you need webspace with PHP and MySQL support. If your hoster blocks POST request from outside your webspace you can not use this feature. You will find the manual for these setting below in this manual. To add a friend to the list just write the Callsign in the text field (delete the word CallSign before from the input field) and click on Add Button. To remove a friend from the list select the Callsign in the drop down box and click on the Remove Button. To use Repeater Reader you have to add a repeater. After downloading Repeater Reader one repeater (DO0JG) is already in the list. If you remove all repeater this repeater will be added automatically again. You can add as much repeater to your list as you want but you can monitor only one. Here you can define what happened when Repeater Reader is starting. select this checkbox if you want that Repeater Reader starts the GPS monitoring after the program starts. 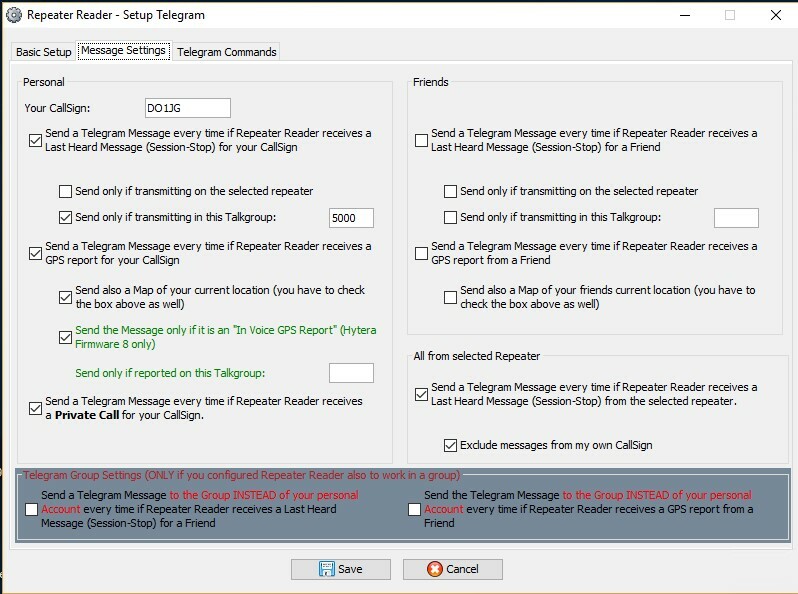 select this checkbox if you want that Repeater Reader starts the Telegram „Server“ after the program starts. 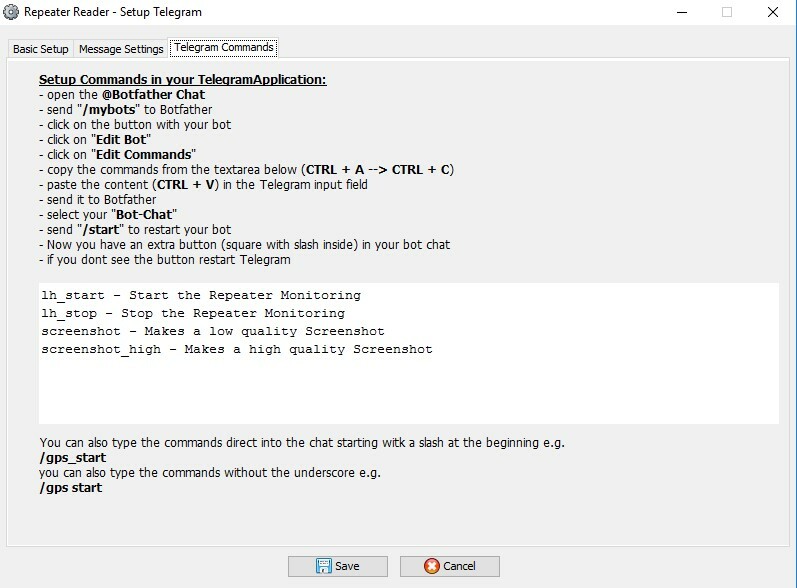 Don’t select this box if the Telegram Server is not configured correctly. 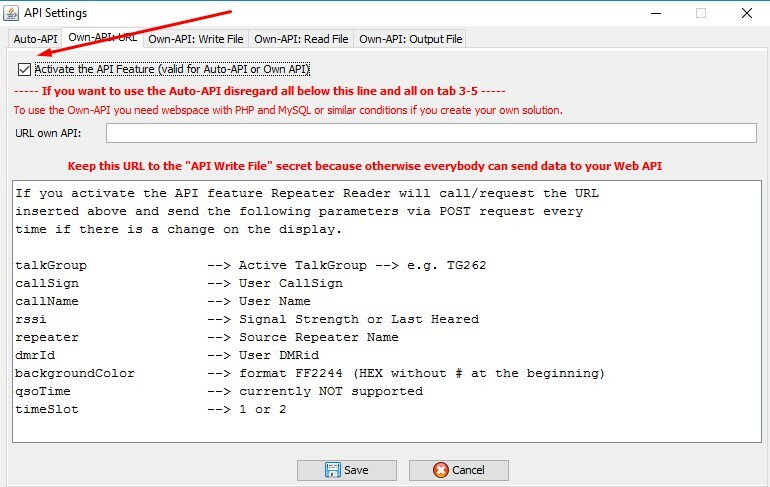 If you want that Repeater Reader select a repeater from your list after the program starts you can select this repeater in the drop down and click afterwards an the button „select on start„, the CallSign of the selected repeater will be inserted in the field right of this button. To remove the „Start Repeater“ click on the X right of this field. Here you can define you own / current position. This position will be used for the GPS reference point. If you don’t use KODI or if you are not familiar with KODI don’t activate this feature. If you are a KODI user you can configure the log in data here. If you select the checkboxes for TS1 and/or TS2 Repeater Reader will send a message (for the selected time slot) to KODI every time an OM starts a QSO. Here you can find miscellaneous options which are not related to the other categories. If you select this option and changes with the ESC key (in the main window) in the Minimized Mode, Repeater Reader will stay on TOP. This means Repeater Reader will not be hidden by other (normal) programs. If you select this option (in the main window), Repeater Reader will stay on TOP. This means Repeater Reader will not be hidden by other (normal) programs. If you select this option no Title Bar is visible if Repeater Reader is in Minimized Mode. Here you can select an own wav file (only wav is supported) for the sound notifications. Click on the folder icon to select a wav file or click on the X icon to reset the sound notification to the default sound. 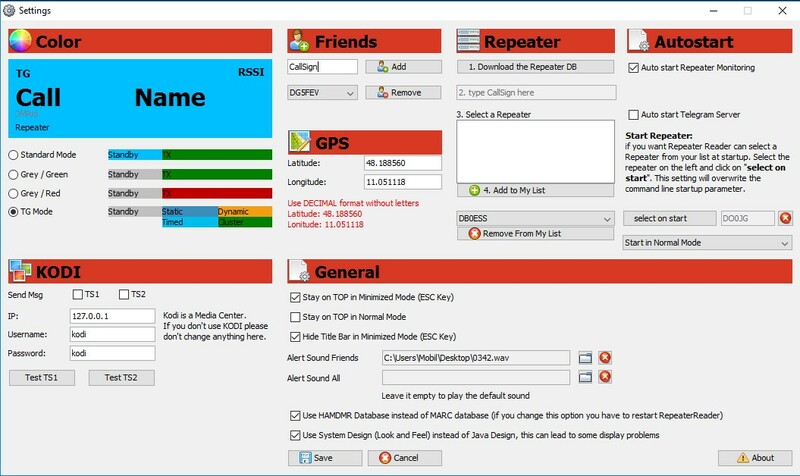 The HAMDMR or MARC database will be used to display the CallSigns / Names in the display. Here you can select wich database you want to use. For German Guys it could be helpful to use the HAMDMR database. If you don’t like the Java Design you can try to use user System Design if you select this checkbox. Keep in mind that this can lead to some small (or in the worst case big/crazy) design problems. If you click on the button „View Chart“ RR will open a new window with a chart. On the top left you can insert the TG you want to monitor. Just insert the TG and click on the Start button. If there is already some data in the log, RR will display up to 15 minutes historical data. If you want to monitor another TG, just insert the new TG in the field and click on Start. To change the Tine Line (domain axis) just select the radio button of your choise. You can also zoom in, click and hold the left mouse button (on the top left corner of the area you want to zooom in) and move the mouse to the right corner on the bottom. Release the mouse button. To zoom out, click with the left mouse button on the chart and hold the left mouse button, than move the mouse to the left and release the left mouse button. For the Last Heard and GPS log, there is an option to export (to CSV) the Log as shown on the monitor. This means, if you activate a filter like to show only TG262, the export function will only export taransmissions on TG262. This Export feature can be handy if you want to analyse the traffic on your local repeater or to collect your own GPS reports. 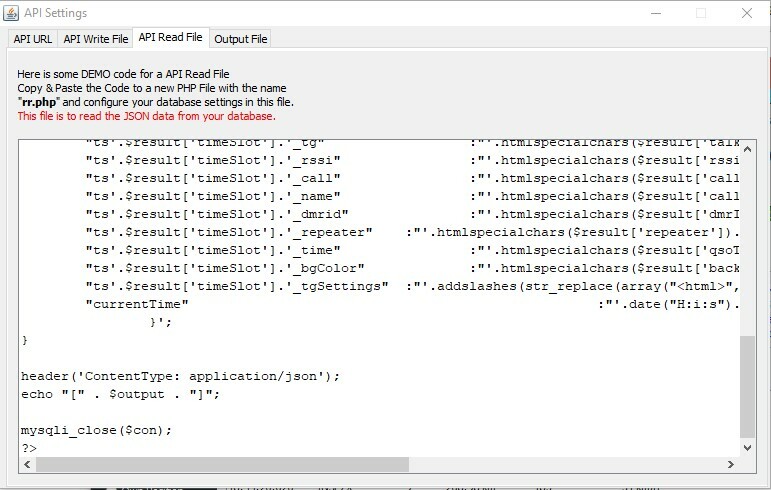 Currently there is no Auto Update of the Log, you have to click on the Reload Button if you want to update the data shown screen. The export feature will always use the latest data. The Log will be permanently cleared if you close RR. The Basic Setup should be self explaining because everything is explained on this tab. Just open this tab in Repeater Reader and follow the steps. The „Personal Box“ is only for messages to your private Telegram Bot-Chat. 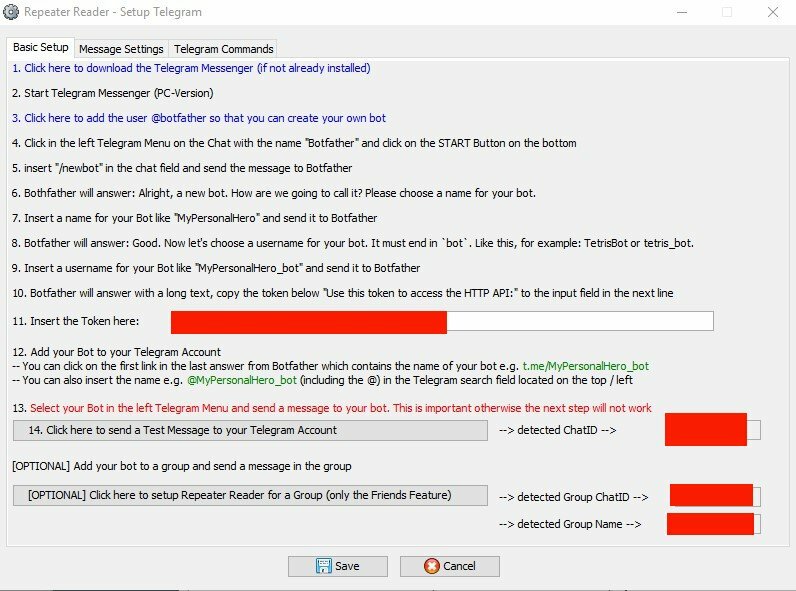 The „Friends Box“ is normally also for messages to your private chat but can be redirected to a „Group Chat“ (if configured on the first tab) if you select the checkboxes in the „Telegram Group Settings Box„. This tab has no options, it contains only the instructions and everything is explained in the tab. 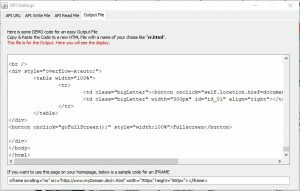 The Web API settings are seperated on 5 tabs. If you are not a programmer, only Tab 1 and 2 should be interesting for you. I will not give any support (like install it for you) for the lower options on tab 2 and all the code on Tab 3-5. Since there is the Auto API it should be as easy as pie to get it working. This will generate 2 Keys, in the second line you will see the API-Write-Key, keep this key secure, also don’t post it in the support groups. This URL includes your Read Key, you can share this link with your friends and put it on your homepage. Maybe later in 2018 I will change the URL to a bedder one, so keep monitoring the Telegram Group to be informed. If I change the URL you have to generate an new key. Now click on „Save“ to save the Keys to your configuration file, if you click on Cancel RR wil lnot save the Keys and you have to start again. 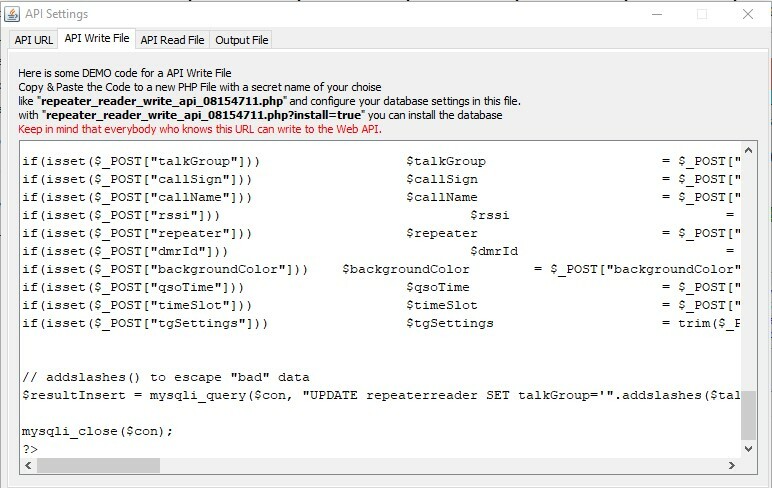 If you forget to copy your link, you can open the Web API Settings window again. Just check the box and click on „Save“ Here you can also deactivate the API later on if you dont want to use it anymore. –> In the Chart Window, insert the TG you want to monitor in the Textfield (top left) and click on „Start“. If you want to change the monitored TG, insert the new TG in the Textfield and click on Start. –> The Chart is updating every second. –> It can happen that very short transmissions ( <= 1 second) are not visible on the chart (if the transmission starts and stop at the same second) this is due to the Chart libary I use, the smallest unit is 1 second. – I changed the Server Adress, you have to use the new version. – Bug Fixes and some improvements I forgot ^^.